Educator Innovator | An LRNG Challenge to Educators in 2016: How Will You Join the Evolution of Learning? An LRNG Challenge to Educators in 2016: How Will You Join the Evolution of Learning? New funding opportunities through LRNG will support connected learning by leveraging rich resources in communities and helping young people connect their interests beyond classroom walls. This was the question we posed to educators across the country last year in our first LRNG Innovators Challenge. What kinds of projects could educators dream up to extend learning beyond the classroom? What opportunities would they create to build on their students’ interests? And what would happen if we gave teachers the resources to make these dreams a reality? Amazing things it turns out. Elementary schoolers in rural New Mexico harvested and dehydrated herbs from their school’s garden to make soap and tea as part of a summer STEAM program. Middle and high school students in South Central Los Angeles invented apocalypse-themed games as part of a 36-hour game jam. And in Washington DC, teens in a hands-on history class interviewed older Washingtonians about their experience living through the great migration. 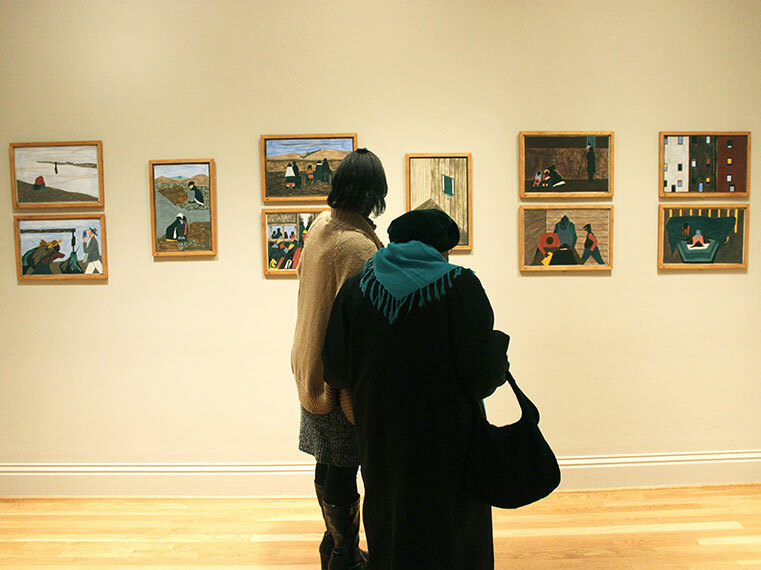 Students interview older Washingtonians in an art gallery in Washington DC. These are just slivers of the larger programs each team of educators created with support from LRNG, a partnership between the National Writing Project and John Legend’s Show Me Campaign. Though the grantees’ work varied in location, size, and ages of students, all 14 introduced new opportunities for connected learning, or learning that happens when students follow their interests and create work that’s meaningful to them. With continued support from the John D. and Catherine T. MacArthur Foundation, LRNG will be able to offer rounds of challenge grants to innovative educators in 2015 and 2016. Plus, LRNG Innovators Challenge was so successful that it has been adopted by Collective Shift, a new nonprofit launched by the John D. and Catherine T. MacArthur Foundation whose mission is to redesign social systems for the connected age. This year, we’re asking, how can teachers take advantage of rich resources in their communities? We’re challenging teachers to develop partnerships and programs that connect in-school and out-of-school learning. The deadline for the LRNG Innovators Challenge is January 13, 2016. Winners of the $20,000 grants will be announced in March 2016. Teachers at Liberty Elementary in Riverside, California wanted to create a project that would engage students and help them build new skills—but they knew that one-interest-does-not-fit-all. The result? A video production station, a maker station, and a garden project that serve as new learning spaces kids can choose between during the regular school day. At the stations, students work on their “passion projects,” making everything from video shorts with green screens to building games with an introductory coding platform called Scratch. At Chicago’s Tilden Career Community Academy, high school students double as reporters, photographers, writers, and filmmakers on Tilden Talks, an online multimedia journal. The publication is a lively hub for both serious and playful content, but it began as a way for a group of teenagers to process the death of one of their classmates. Teachers and their partners from the Center for Community Arts Partnerships at Columbia College Chicago and Chicago Public Schools turned it into an all-year project and today it’s an empowerment tool and a place for young people to use digital technologies to tell their own stories. For more, check out our three-part webinar series and radio show, where grantees from nine different projects dive into the details of their work. Learn how teachers in the Bronx guided students in conducting community-based research on cyber bullying and other topics and presented their findings to state legislators. Or how teachers in North Carolina set up pop-up makerspaces during an extended lunch period where students fold origami, draw with 3D pens, and build with modeling clay. We can’t wait to see what you’ll come up with next.